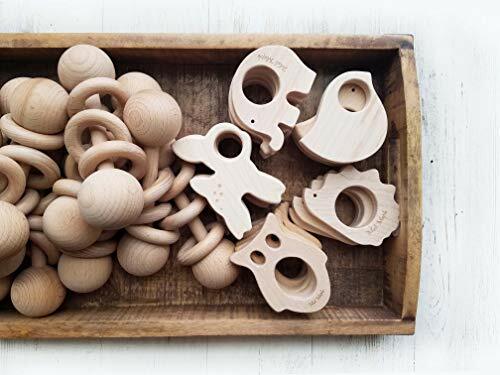 Natural and Beautiful Wooden Teethers and Toys. ♥ We keep it Simple! Natural and Untreated. Made with a single cut of Solid Beech Wood. Hand Crafted and sanded to a smooth finish. ♥MORE WOOD! 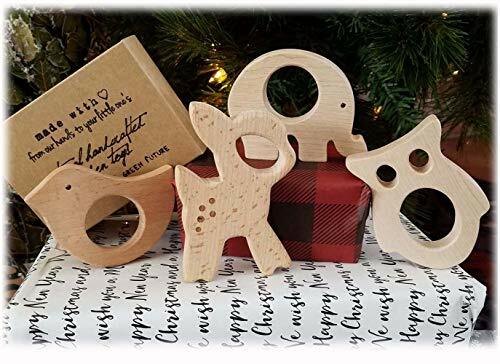 Our Wooden Teether Toys are now 30% Larger in size then the common tiny teether that requires to be on a pacifier leash for size safety. These are a Great Hand Holding Size for teething infants eliminating choking hazards. ♥This same set also available in Maple Wood. "Mali Maple". ♥ Nature carries its own perks! Wood Naturally has antibacterial and antimicrobial properties! Unlike Silicone teethers, wood doesn't attract dust, no need to keep rinsing. ♥ Medium Size Teethers great for Teething, easy on baby's hands. Multi Use- Toys for Playing, Photo Props or Keepsake for years of Reminiscence. 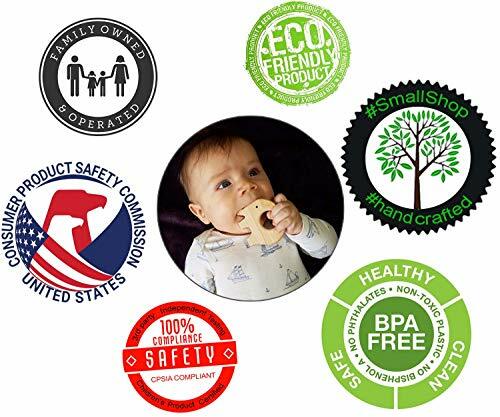 Easily Attachs to stroller, car seat, baby gym, teething necklace, pacifier straps. ♥ Wooden Toys Are Generational gifts! How Wonderful! Easily sands down to perfection and passes on to grandchild! Comes in a Cute Gift Box, Ready for gifting. ♥ Do not use with high temperature water or heat as it may cause wood to dry, crack and become rough. Time to clean your wooden teether? Simply use a fine grit sandpaper, similar to nail filer, and brush away any dirt or damage on the wood's surface. This is the best way to safely restore and clean your natural untreated wooden toys. Each teether measures a little different approx. size is 6cm by 8cm. Please Note Our Teethers have not been tested on animals. A dog's bit has an avg. of 250lbs of pressure per bite. Keep away from pet's bite and Saliva.